When we arrived on January 22, we had little plan in place beyond our first two weeks in Buenos Aires…it wouldn’t be until March 30 that we would leave the country. What amazing natural diversity from north to south and east to west. Like any other country, Argentina has its quirks but there’s reason we spent a quarter of our trip in this gorgeous country. In Bariloche, I noticed a preponderance of young men with short hair on the side, long hair top and back. I’ve learned that there are attractive versions of this do and…not so much. Tried to convince Sean to take on the look and bring it back to the states. He’s not biting. 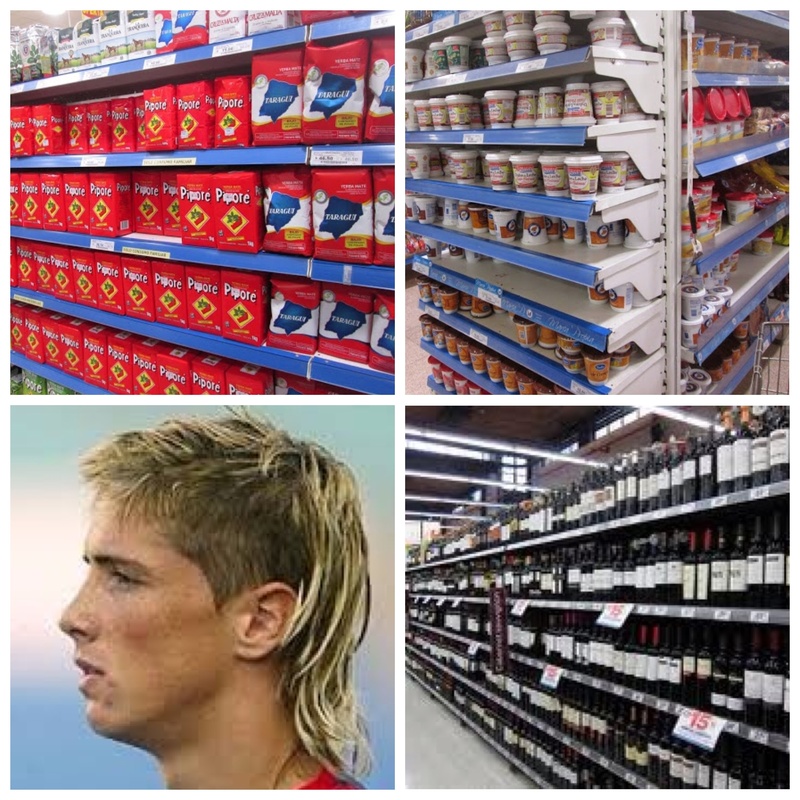 The preponderance of products in an Argentinian supermarket fall into three categories: Mate, Dulce de Leche & Vino. 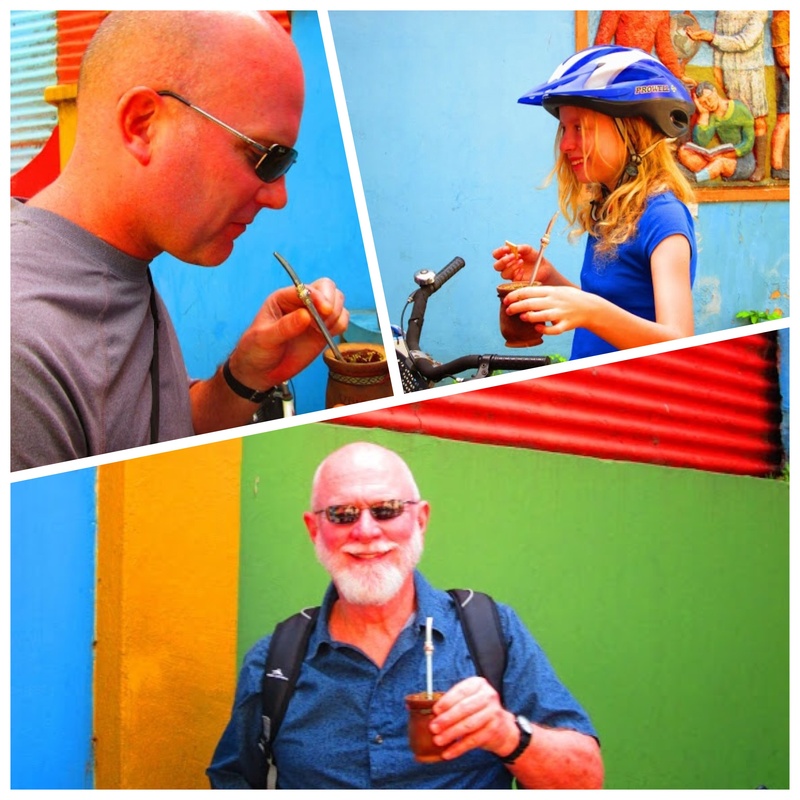 More on the national drink below, Mate…its aisle is akin to the coffee aisle in the states. The Dulce de Leche surprises me though, how many types of Dulce de Leche does one really need? While I am a caramel lover and dulce is not so far removed, I could not get used to it as a spread for toast at breakfast. But vino, that I get. The Malbec that the country is famous for and the high altitude Torrontes deserve as many aisles as possible. The Argentinians are onto something here. It’s common to encounter family or friends strolling through a park, sitting in the plaza, hanging out front their workplace…with a large hot water thermos and a mate cup and straw. This ritual is a way to slow down life and appreciate family and friends. The cup is shared with one person taking lead on refilling it with hot water and mate tea as needed. A perfectly beautiful way to appreciate life. With the Argentinian financial crisis, the peso continues to be devalued. The official governments exchange rate to the dollar is roughly 3-4 pesos lower than what one can get in the blue market, which is for all purposes a black market. Before arriving here, I questioned meeting a “friend of a friend” to change money, however you pay 1/3 more if you don’t. Credit cards with no foreign transaction fees are on the official rate, so it becomes a cash system. ATMs are a joke…not only do you get the official rate, but you can only take out roughly US$100 at a time at the cost of $10 in transaction fees…you can however do this 3x a day for $30 in transaction fees. Ouch. And as tourists, we may feel a bit cheated if we’re not using pesos purchased on the blue market, but think about being an Argentinian! The cost of goods is constantly raising while your paycheck stays the same. People who are in the position to do so purchase dollars as investments. Others spend every peso they make because why put it in the bank? A very tough situation. 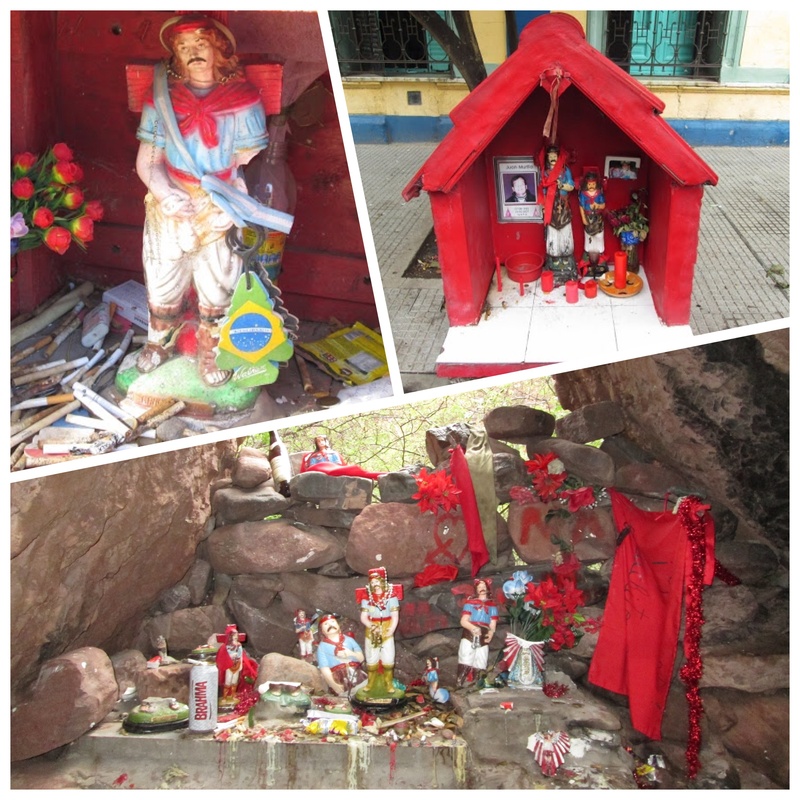 It wasn’t long after our arrival to Argentina that I noticed small red altars housing a diminutive cowboy along many a country road. I soon learned that this was Gaucho Gil. There seem to be multiple stories on his life and purpose but he is best described as the saint of the roads. His story in a nutshell: he was the Argentinian Robin Hood, stealing from the rich and giving to the poor. When caught by the local police to be killed, he gave the prophecy that the police captain’s young son would die if Gaucho Gil was not properly buried. (There are many versions of this…in some the son dies, in others he does not.) The bottomline is Gaucho’s prophecy came true and he is referred to as a saint today. We saw these alters from north to south, with offerings of coins, cigarettes, sodas (partially drunken) among other items. It goes without saying the importance of futbol in the Argentinian culture. We appreciated witnessing the passion. Our only complaint was the constant chorus of “Goooooooooooooooal!” during evening sports highlights. 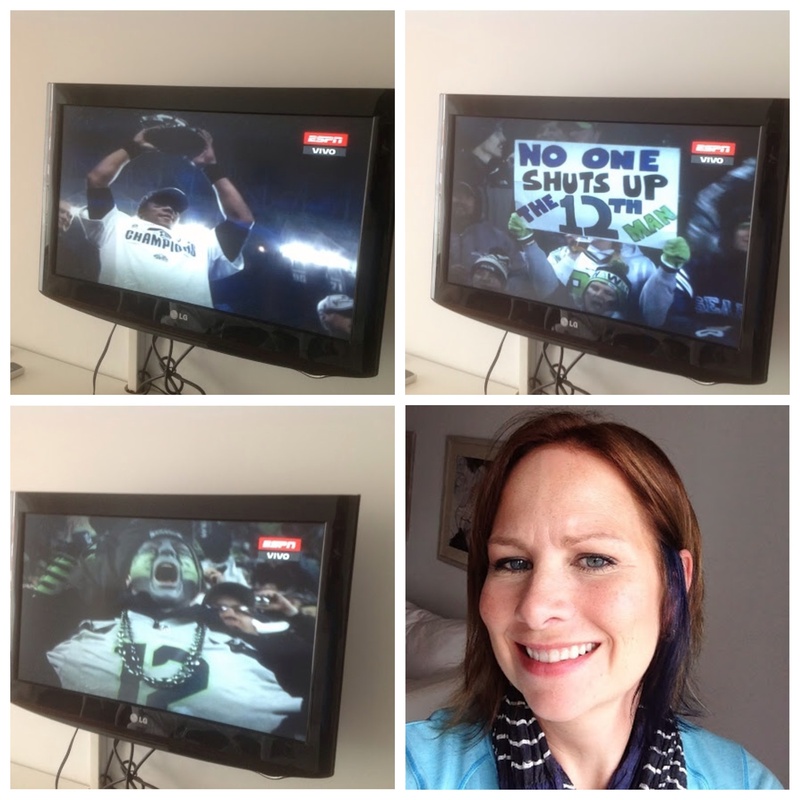 We Missed a Real Argentinian Futbol Match but We Did Enjoy Seeing a Different Kind of Football…our Seahawks Win the Superbowl from Buenos Aires! 5 big pairs of feet, one little campervan.